Gatlinburg is home to a wide variety of restaurants offering everything from classic Italian dishes to authentic Mexican cuisine! Whatever you’re craving, you’re sure to find it here. To help you make the most of your trip, here are 6 of the best restaurants in Gatlinburg that you just have to try. True to its name, Best Italian Cafe and Pizzeria has some of the most delicious Italian fare in the Smoky Mountains! For years, this restaurant has kept its title by continuing to offer mouthwatering classics like golden garlic knots, traditional pizzas, and creamy pasta. Although they’ve perfected their traditional menu items, signature dishes like their large, flavor-packed calzones are also very popular. You can always count on fresh ingredients when you stop by Geno’s Pizza! This restaurant prepares their pizzas with dough made in house daily with your choice of toppings. You can also treat yourself to one of their sandwiches, subs or calzones. To complete your meal, be sure to give their chicken wings, breadsticks or salad a try! It’s always a celebration at Loco Burro Fresh Mex Cantina! You can take a ride on the bucking donkey while you’re waiting for your meal or kick back and relax on the rooftop patio by the fire pit area. If you aren’t sure what to try, you can’t go wrong with their famous fajitas and a margarita! Another one of the best restaurants in Gatlinburg is the Alamo Steakhouse and Saloon! The mouthwatering, aged steak there is hand cut and seasoned in-house for a truly fresh and savory taste. They also grind their own burgers, make all of their own soups, sauces, and gravies, and hand-bread their mozzarella sticks. When food is made with such care, you can count on it to be absolutely delicious! If you’re in the mood for some award-winning barbeque, Bennett’s Pit Bar-B-Que is where you need to go! This eatery offers real hickory-smoked ribs, chicken, beef and pork options that are sure to leave you satisfied. Their freshly made sauce is even served on the side so that you can enjoy as much or as little as you like with your barbeque. In addition to barbeque, their full menu also has numerous appetizers, a soup and salad bar, and other tasty main courses! 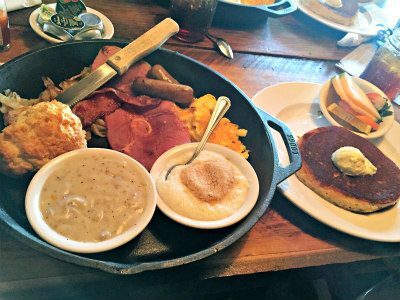 Whether you’re a fan of breakfast or brunch, the Log Cabin Pancake House is the restaurant for you! You’ll find a wide variety of menu items from pancakes and french toast to cheeseburgers and club sandwiches. They also have a hot lunch buffet which includes a freshly prepared variety of meats, vegetables, rolls and cornbread, a salad bar and dessert! There’s even a children’s menu that any picky eaters are sure to love! As you can tell, there is no shortage of places to grab a bite to eat here! Be sure to check out these restaurants in Gatlinburg, and all the other fantastic Smoky Mountain restaurants so that you always know where to go for a great meal! Our private cabin is perfect for small families! It’s tucked away, offering you just the right amount of seclusion while still being just a short drive from the best attractions. To help you plan your family’s vacation, we’ve put together a guide of the top 5 family-friendly things to do in the Smoky Mountains. The Island in Pigeon Forge is your one stop for affordable family fun. With more than 60 retail and specialty shops, restaurants and eateries, rides and games, and so much more, your family will have a blast! One of the best things to do with your family at this attraction is ride the Great Smoky Mountain Wheel, which offers incredible views of Pigeon Forge. The all-glass gondolas seat up to 8 people, so the whole family can ride together! Dollywood is one of the can’t-miss things to do in the Smoky Mountains for families. From world-class rides to award-winning dining, you can have a whole day of fun at this theme park! Throughout the year, Dollywood holds a number of festivals to help you celebrate the seasons, like the Harvest Festival and Smoky Mountain Christmas. If you visit during the summer, make some time to visit Dollywood’s Splash Country for some fun in the water! The Great Smoky Mountains National Park is the perfect place to take in the natural beauty of the mountains. With more than 850 miles of trails for you to explore, your family can spend the afternoon having a picnic and going for a hike! Some of the most popular family-friendly hikes are the Gatlinburg Trail, Grotto Falls, and Laurel Falls. At Ripley’s Aquarium of the Smokies, not only can you see all your favorite aquatic animals, you can interact with them too! What makes this Gatlinburg aquarium so great is that there are numerous unique experiences that put you face-to-face with the animals. You can touch a jellyfish, swim with stingrays, and even waddle with penguins! For the ultimate adventure, ride in a glass bottom boat to the heart of Shark Lagoon. On the Glass Bottom Boat Adventure, just 3 inches of glass separate you from the 12-foot sharks that call the lagoon home! Ober Gatlinburg is known for its skiing, snowboarding, and tubing fun, but this attraction is popular in all the other seasons too! Ride the Aerial Tramway to Ober, with gorgeous sights of downtown Gatlinburg and the Smoky Mountains below you. Then you can ride the Ski Mountain Coaster, visit the Wildlife Encounter, go ice skating, and so much more! There is even a special Kiddie Land just for the little ones. The whole family will have a blast at this family-friendly Smoky Mountain attraction. These are just some of the many family friendly things to do in the Smoky Mountains. The best part is that they are all only a short drive from our Smoky Mountain cabin! Browse more things to do in the Smoky Mountains and start planning your family vacation today. Learn everything you need to know to have the perfect trip to Dollywood when you stay at the Lazy Bear Cabin in the Smoky Mountains. For a day filled with rides, delicious food, and show-stopping entertainment, visit Dollywood in the Smoky Mountains! With so many things to do, you might find it hard to experience all that the world-class theme park has to offer in just one visit. That’s why we’ve put together a guide to the perfect trip to Dollywood, from the best things to do to tips for buying tickets! With more than 40 incredible rides and plenty of high-energy entertainment, there are days’ worth of family-friendly fun to be had at Dollywood! Whether you’re looking for a thrill or more relaxing fun, there is something for everyone. Climb aboard the Dollywood Express for a breathtaking 5-mile journey through the foothills of the Smoky Mountains, or experience a 20-story fall on the exciting Drop Line ride! There are even rides just for the little ones, like Busy Bees and Piggy Parade. After all your fun testing your fears on all the rides, go see a show! Dollywood sets the stage for a variety of award-winning performances throughout the year that you don’t want to miss. When you visit Dollywood, be sure to take some time to browse the shops and find the perfect souvenir to bring back home with you! You can find everything from apparel to mountain-inspired gifts at the different shops in Dollywood. One of the best shops to visit is The Dollywood Emporium, which offers the ultimate Dollywood shopping experience with a large selection of apparel, gifts, tasty treats, and more. After a fun-filled day at the park, we bet you’ve worked up quite the appetite. Luckily there are so many delicious dining options in the park! Enjoy an all-you-can-eat buffet at Aunt Granny’s Restaurant, or try one of Frannie’s Famous Fried Chicken Sandwiches. Before your visit is over, you have to try some of the world famous cinnamon bread from The Grist Mill, or a slice from the Spotlight Bakery’s 25-pound apple pie! Throughout the year, Dollywood puts on incredible festivals for visitors to enjoy. There’s the award-winning Smoky Mountain Christmas that is sure to get you in the holiday spirit, the Barbeque & Bluegrass Festival where you can eat the tastiest barbeque you’ve ever had while listening to incredible bluegrass music, and the Harvest Festival where you can watch the leaves change in the fall while listening to the uplifting sounds of Southern Gospel. Other popular festivals include Festival of Nations, Rock the Smokies, and Dollywood’s Summer Celebration! Check out the Dollywood operating calendar to help you decide when you should plan your visit. Dollywood has a number of ticket options for visitors to choose from. If you want more time to experience everything the park has to offer, get a 2-day or 3-day ticket! The park also offers season passes if you plan on visiting multiple times throughout the year. 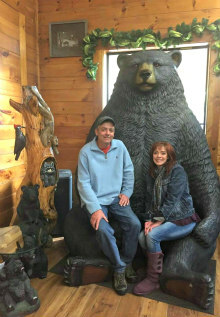 Our Lazy Bear Cabin is only about a 15 minute drive from Dollywood! It’s the best place to stay when you visit the theme park. It’s located right between Gatlinburg and Pigeon Forge and offers just the right amount of seclusion. Admire the stunning mountain views as you relax in the bubbling hot tub, or shoot a game of pool inside! This 1 bedroom cabin in the Smoky Mountains has everything you need to feel right at home. Now that you know how to have the perfect trip to Dollywood, it’s time to start planning your visit! Check out more attractions in Pigeon Forge and see what other fun you can have while you’re here. On August 18th of 2018 the Townsend Visitors center will be holding the annual Smoky Mountain Hot Air Balloon Festival. Craft beer, wine tasting, food trucks and live entertainment will fill the mountains.